Since our last developer blog we have received a large amount of feedback on raids rewards. We've gone back to the drawing board and will be offering some brand new weapons in addition to some of the content offered in the previous blog. The video found below shows off the two new weapons being offered in this developer blog: the elder maul and the elder wand. Please watch the video and give the blog a read to get an idea of what these weapons will be. The elder maul is a powerful two-handed crush weapon which requires 75 attack and strength to equip. It is accurate, slow and hard hitting. When designing the elder maul, our primary objective was to create an interesting, balanced and fun alternative to current top tier weapons. There are many scenarios where the maul is ideal, and many where it isn't. The elder maul does not have a special attack. The maul attacks at the same speed as a godsword, however it is more accurate and is capable of hitting harder than the godswords normal attacks. The godswords will still have higher max hits due to their special attacks, and will also be able to provide more utility. We expect the primary use for the maul to be in PvP, however it will definitely have valuable PvM applications as well. Monsters which require you to deal hard hits as quickly as possible, such as the chaos elemental and tortured gorillas, will be perfect for the elder maul. It will, of course, also be very useful against monsters which are weak to crush attack, such as Cerberus, Vet'ion and waterfiends. In PvP, we expect the elder maul to introduce a bit more variety. Currently, there are very few weapons to choose from which are viable in PvP. The elder maul will help mix things up a bit, offering a good option for both a primary weapon and a KO weapon. 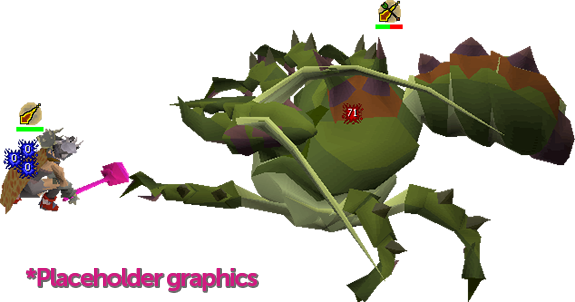 Overall, the elder maul is a weapon which will help add a bit more variety and choice to Old School for high level players. The elder wand is a high level magic weapon created from the master wand and an item dropped from raids. The elder wand requires level 75 Magic to equip. In addition to the stats shown above, the elder wand both acts as a water staff and provides a 15% chance of negating rune costs when casting a spell. It can be used to autocast ancient magicks. Kodai robes are a new set of magic and prayer robes which provide best-in-slot magic attack. The robes will require level 75 Magic & Prayer to equip. The robes provide magic attack slightly greater than Ahrim's robes, but lack the defences the set offers. Kodai robes also offer prayer bonus and do not degrade. The biggest piece of feedback we received for Kodai robes was their potential impact on Ahrim's robes. As a result, we've stripped all of the defences of the robes except for magic defence. This leaves Ahrim's with some substantial stat advantages. 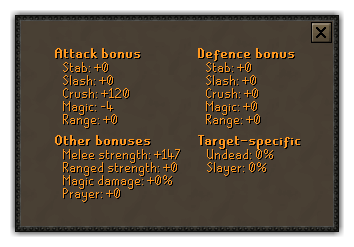 We've also given the Kodai robes some negative melee and ranged defence bonuses to give Ahrim's another slight advantage. The additional prayer bonus should help the Kodai robes remain just as valuable, while leaving room for Ahrim's to play the role of a tankier of the two sets. The dragon platebody would be created using drops from raids with a dragon chainbody. Dragon throwing axes provide +32 Ranged attack and strength. The special attack of the axes freezes the target for 5 seconds if damage is dealt and costs 30% special attack energy. Following a large amount of feedback from the community, we are no longer offering insignias as a reward from raids. As always, we are eagar to hear your feedback. Let us know what you think about the above rewards! Looks fine to me, elder wand little powerful, also rip 3a mage hat. Wasn't expecting to like it, but I really like how these weapons have extremely niche uses. The kodai robes are also interesting and I like how they're max dps but only if you take little to no damage. It's a shame insignias are gone and most of the prayers are useless, but over all I think that you guys have done a great job, will be fun to camp raids for this.